Seth Dettling is working magic with Alabama corn. 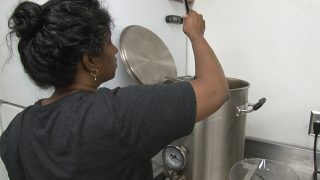 Maybe it’s more alchemy than magic, but the CEO and head distiller of Big Escambia Spirits is taking Alabama corn and turning it into Alabama bourbon. 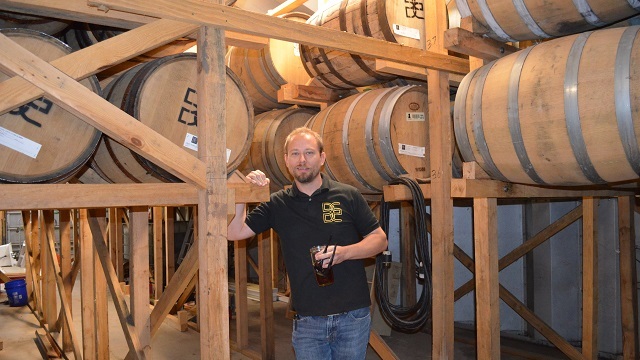 With his Dettling brand of bourbon, he’s hoping to define what an Alabama bourbon is supposed to be. In a state that grows great corn and has many hot months, Dettling said he’s surprised others haven’t tried to make bourbon here. It might have been logical, but it hasn’t been easy because Dettling didn’t want to take the easy way. Big Escambia Spirits is an Alabama Maker out to define Alabama bourbon from Alabama NewsCenter on Vimeo. There are those who buy their clear spirits from someone else and modify it and resell it under their brand. Dettling wanted to make bourbon from raw ingredients to an on-the-shelf product, controlling the quality and consistency at every stage. By controlling the process from corn to bottle, Big Escambia Spirits accounts for all the variables: How much corn is grown? How much crop will it yield? Is that enough tonnage to allow for production? How much bourbon is being produced now? How much does he hope to produce when the next crop is planted? To make Dettling bourbon, Big Escambia starts with a corn with a cake-like, bready flavor and combines it with six grains for the mash. The yeast and the fermenting and distilling all take place before the barreling. The barrel will add about half of the remaining flavor to produce the final bourbon. All of it happens at Big Escambia’s distillery at the end of a dirt road in Atmore. 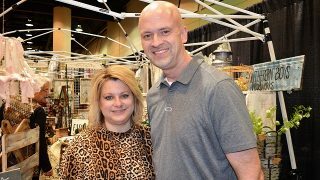 March 15 was a big day for Big Escambia Spirits. Straight bourbon meets stricter legal requirements than regular bourbon, primarily being that it’s aged at least two years in the barrel. The new label is green and has the word “straight” stamped on it. Dettling has released some single cask strength bourbons in a brown label and some other special editions under its “Bespoke” line, which includes a four-wheat bourbon that’s on the shelves now. But you have to get what’s out there now because that won’t be produced again. Now that his bourbon is aged to the straight bourbon level, Dettling said they will see where in the process the bourbon reaches its peak flavor and hopefully that will set the standard for Alabama bourbon. How will Alabama bourbon compare with other bourbons? Dettling said he conducts his own side-by-side comparisons with family and friends whose palates he trusts. But it was a stranger who gave Dettling his biggest confidence boost. Then he pulled a taste from one of the barrels. But he is most proud of the way the product is being received in the state. Dettling said he enjoys plenty of other bourbons. But what Dettling wants most of all is for Alabama bourbon to become a thing. He hopes his customers will do just that. The product: Alabama bourbon produced as cask strength, straight and other offerings. Take home: A bottle of straight bourbon ($37). You can follow Big Escambia Spirits on Facebook and Instagram. Tornado watch in effect for north, most of central Alabama until 11 p.m.
PDS tornado watch In effect for much of Central Alabama until 11 p.m.